I spent the morning at Fido’s Farms, not far from me…a place that trains herding dogs. Hansen School had organized a field trip to see the new lambs, watch herding and agility exhibitions and become herders themselves (of ducks). I demo’d spinning and weaving with a friend. For my efforts, besides lots of smiles, I received “as many fleeces as I want” – and came away with 2 coopworth fleeces. They have LOTS of white fleece, ewe and lamb hogget (first clip, usually considered the finest). It is long medium crimp, not exactly skirted to a spinners specification, but wonderful stuff as best I could quickly determine. Chris Sonderson runs the farm and always has fleece on offer to anyone that wants to use it. Such generosity needs to be taken seriously. I need more fiber like a hole in my head and I have 2? No control. Dues may be paid at the May meeting or the June Picnic. Each person paying dues needs to fill out COMPLETELY the Application Form. At the last meeting, the weavers voted to continue listing equipment and areas of expertise. In order to update our Year Book, we need you to complete the form (not “same as last year”) Only that information will be used to update. Thank you for paying your dues on time. 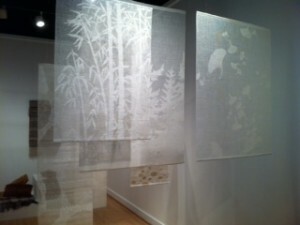 Intertwined: Requiem for the Trees, March 10 – May 6, 2012 at the WA State History Museum, 1911 Pacific Avenue, Tacoma. This show was created to honor and remember trees at Kopachuck State Park, Henderson Bay, which have to be removed because of a root disease. The Spring Fair & Shepherd’s Extravaganza is April 19-22 at the Puyallup Fair Grounds. Please note that if you have spinning & weaving equipment you’d like to sell it is possible to do so at the fair. Full details are available at: http://www.shepherds-extravaganza.com/. Fiber Festival/Spin In in Pasco Wa TRAC Center April 28-29. Spinners from N. Idaho, Spokane, NE Washington, and Tri-Cities are planning to attend. There will be classes, spinning contests, vendors, etc. Website: www.pnaafiberfestival.com. Aesthetics of Funk by fiber artist Xenobia Bailey at Northwest African American Museum, 2300 Massachusetts Street, Seattle. October 29, 2011 – May 6, 2012. “Explores the aesthetics of funk one stitch at a time through her visually stunning fiber works.” More details at www.naamnw.org. Woad Workshop with Denise Lambert May 12th and 13th at Magnuson Park, Seattle. Surface Design WA is offering a rare opportunity to learn the art of woad dyeing from dye master Denise Lambert of Bleu de Lectoure in France. Denise was instrumental in the revival of woad cultivation and use in France and has adapted this ancient medieval dyeing technique to modern times. Follow this link for more workshop info and sign-up details: http://surfacedesignwa.wordpress.com/2012/02/17/woad-workshop-with-denise-lambert-may-12th-and-13th/. A Presentation on Scandinavian Weaving, May 17 at 7pm, Poulsbo Sons of Norway Lodge, 18891 Front St. Poulsbo Given by Kay Larson, author of The Woven Coverlets of Norway. Suggested Donation $2. Please bring pieces of weaving for identification. More details are at: www.poulsbosonsofnorway.com. The Northwest Regional Spinners Association 2012 Annual Conference will be held at the University of Puget Sound in Tacoma, WA, from Thursday May 31st-Sunday June 3rd. Conference brochure and registration info are at: www.nwregionalspinners.org/Pages/events.html#2012Conference. The Nordic Heritage Museum presents Weaving in the Northwest: an exhibit honoring the weaving heritage of Margaret Bergman in conjunction with weavings of Seattle Weavers Guild members, reflecting their Scandinavian textile heritage. The SWG exhibit is part of a public presence celebrating the 75th anniversary of the guild’s founding and will be on exhibit until May 6th at the museum. The Nordic Heritage Museum, located in the colorful Ballard community, is a gem of immigration history, which encompasses a depth of textile work throughout the rich Scandinavian heritage. For specifics of where/when/ how much, go to www.nordicmuseum.org Treat yourself to a great NW experience. The Portland Handweavers Guild Annual Sale, Handwovens Plus, showcasing the work of over 40 regional textile artists will be held May 4-6, 2012 at the Oregon Convention Center located at 777 NE Martin Luther King Boulevard, Portland, Oregon. Sale hours are Friday, May 4, 10 A.M. to 9 P.M., Saturday, May 5, 10 A.M. to 7 P.M., and Sunday, May 6, 10 A.M. to 5 P.M. Admission is free. This is a once a year opportunity to browse and purchase unique, handmade fiber art ranging from wearable art to useful table linens to decorative basketry. Choose from jackets, scarves, shawls, placemats, blankets, rugs, bead weaving, baskets, both functional and sculptural, yarn and much more. John Beard will be demonstrating Ravenstail weaving, an ancient Northwest Coast Indian technique all three days. Daily demonstrations of weaving, spinning and basketry and children’s hands-on activities will be ongoing. There will be a fashion show each day at 2:00 P.M. The Portland Handweavers Guild has been in existence for over 60 years. In addition to providing its members with educational opportunities through lectures, workshops, scholarships, study groups, and venues to sell and exhibit their work, the Guild is fostering a future interest in the craft by supporting the weaving program at DaVinci Art Magnet School. Members promote the craft of weaving through public outreach demonstrations at schools and fairs. This event is held in conjunction with the annual sales of the Oregon Potters Association Ceramics Showcase, the Creative Metal Arts Guild, the Oregon Glass Guild, the Northwest Fine Woodworkers Guild, the Guild of Oregon Woodworkers and the Portland Bead Society.